Mike Machat Hand Signed and Numbered Limited Edition Print on Paper: "Tahiti-Takeoff"
About the Artist: In this fantasy image, we see a Lockheed 1049G Constellation - the first Air France airliner ever to serve the lush tropical resort of French Tahiti - taxiing out for takeoff just as the magnificent Aerospatiale Concorde supersonic airliner takes to the skies. 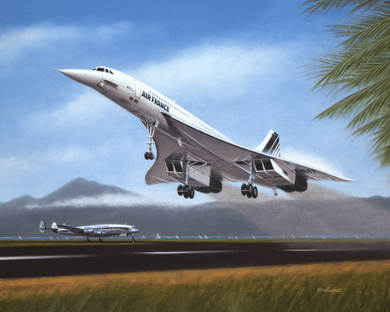 Painted as a menu cover for a round-the-world Concorde charter, this image captures the raw power of this amazing airplane as it lifts off at a blistering ground speed of 245 miles per hour! The artist was flown in the cockpit of this particular airplane to Mach 2.04 at 58,700 feet.